It has been almost twenty-five years since 1988, when I left for New York and then Paris with a dream of not only seeing flowers and beautiful floral decorations but also doing that kind of work. In Paris, I happened to meet G. François, who can be called my life-long flower mentor, studied the essentials of French florists and the traditions and modern nature of floral art, and started work with a feeling of wanting to be able to introduce the French lifestyle of l’art de vivre to Japan through flowers. 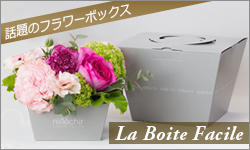 I reached a stage where I brought all these past activities together and opened the Salon Boutique de Fleur RÉFLÉCHIR KYOKO FUJITA in Nishi-Azabu, Tokyo, in February 2013. 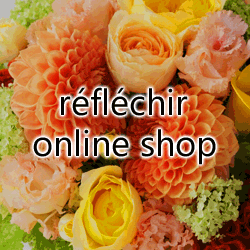 The name of the salon is RÉFLÉCHIR, which means “to think carefully, reflect” in French. At the salon, I would like to be able to once again carefully reflect on various things that I have come across in my life (people, flowers, cities, art, etc.) and express them. Studied flower arrangement and table setting under Fumi Kimura (through 1987). Moved to France (through 1990). Studied under Georges François and trained at Liliane François. Received instruction from leading French florists including Claude Simondon, Marianne Robic, and Baptiste Pitou. Returned to Japan. Ran Cours de Décoration Florale and launched a course of the same name in Tokyo. Presented “Kyoko Fujita avec Liliane François Japon” at the Promo-arte Gallery. Established KYOKO FUJITA Co., Ltd. Presented “Surprise de Noel avec Kyoko Fujita et Peninsula Flower shop” at the Peninsula Hong Kong. Held a demonstration seminar for the Ministry of Foreign Affairs Ladies’ Association at the Hatoyama Family’s Otowa Mansion. Responsible for floral decorations for the Comité Colbert Year of Japan’s Gala Party held at the official residence of French Ambassador. Published Les Bouquets: Exploring the Possibility of Flowers (Sekai Bunka Publishing Inc.). Held a demonstration at the City Club of Tokyo. Moved to France (through 2005). Invited Claude Simondon (an awardee of M.O.F (Meilleur Ouvrier de France / Best Craftsman of France)) to give a lecture at La Maison Franco-Japonaise. Returned to Japan. Moved from Tokyo to Kyoto (through 2011). Gave a demonstration lecture for the Ministry of Foreign Affairs Ladies’ Association. Presented “Kyoto and Paris: The World of Flowers and Lalique” at Galerie Orphée in Kyoto. Responsible for floral decorations for the Champagne Association (at the France Embassy). Responsible for floral decorations at the Finest Collections of Prestigious Japanese Families held at Hotel Okura. Moved back to Tokyo, which became the center of activity. Opened salon boutique de fleur réfléchir in Nishi-Azabu, Tokyo. Appeared and covered in various magazines including Katei Gaho; Fujin Gaho; Waraku; Story, Very, Classy; 25ans; eclat; Mrs.; Miss; Hanajikan; Best Flower Arrangement; and Seven Seas. Produced floral decorations used at various events including not only ones for the Monaco Tourist Bureau and France Embassy but also corporate ones for Cartier, Chanel, Hermes, Giorgio Armani, Gucci, Baccarat, Montblanc, and Anteprima. Produced floral decorations for numerous clients’ wedding receptions held at locations including the Heian Room of the Hotel Okura Tokyo. Planned and conducted tours that tied stays at chateau hotels, such as the Hôtel de Crillon, with room decoration demonstrations. We will set up a florist section to sell bouquets and flower arrangements, and develop flower-related specialty shops. We shall handle diverse needs and occasions by making use of fleur à fleur, Kyoko Fujita’s brand of artificial flower arrangements, in order to meet growing demand. We will regularly hold flower arrangement lessons. In addition to offering classes for people interested in flowers as a hobby, in order to train florists who possess a strong sense of beauty, we will arrange a series of classes for semi-professionals and people who want to become professional. Furthermore, we envision occasionally opening an aperitif bar, juice bar, Weekend Marche, and café that suits the place and my likes. I often told this to children when I was in Paris. I decided to start this salon/boutique after carefully considering matters. There are many things I want to try, and I wonder how far I can take this. I would be happy if with the wisdom and help of everyone, I can communicate, even if only slightly, something useful for the world through flowers.